Brookfield’s Trevor Sterry (3) and Michael Quinn (22) trips up Hillhouse’s Treronn Bryant on Friday at Bowen Field in New Haven. Brookfield won 51-18. NEW HAVEN — There were sweeps for long gains, bruising sprints through the line and simple jaunts that gained yard after yard. The Brookfield football team likes to the run ball. That much has been evident in wins over Masuk and Hillhouse to start the season. But it’s one thing to favor a style and another thing to thrive at it. Brookfield, with an array of backs, simply excels on the ground. Brookfield, fresh off their season-opening win against Masuk, ran around and through the Hillhouse defense Friday night at Bowen Field. The 51-18 victory was emphatic for a team with postseason designs. Brookfield (2-0) compiled 351 yards on the ground, led by Conor McVey (15 carries, 176 yards) and Nicholas Henderson (21 carries, 133 yards). Brookfield rolled to a 25-6 halftime lead, dominating on both sides of the ball as it put Hillhouse (0-2) in insurmountable hole. How lopsided was the first half? Hillhouse was unable to move the ball past its own 22 and its offense generated minus-2 yards in the first quarter. Its first possession of the second quarter ended with a stray snap being recovered in the end zone for a safety. Brookfield, meanwhile, was efficient and productive as it marched to a 25-0 lead. On its second possession, Brookfield moved 37 yards and scored on a 7-yard run by McVey. There would be a safety on an errant snap by Hillhouse to make it 9-0 before Henderson scored on a 4-yard run as time expired in the first quarter. Said McVey, “Me and [Henderson], we build off each other. With use, we feel like there’s always a threat in the backfield. At 8:00 of the second, quarterback Trevor Sterry ran left on a sweep to score from 7 yards and Jackson Breuel’s point after kick made it 25-0. The crowd at Bowen Field was muted as Hillhouse sputtered and Brookfield surged ahead. But there was a glimmer of hope for the home crowd late in the half. After three consecutive incomplete passes and facing fourth-and-15 from its own 32, Hillhouse threw another pass. This time, Sahim Hasan connected with Demelle Turner. Scampering through defenders and evading tacklers, Turner didn’t stop running. The 68-yard touchdown pass brought the home crowd to its feet. It was 25-6 at halftime. And the Academics offense, so stagnant early, came to life in the second half. Maybe it the was the long completion that ignited the unit, but Hillhouse found its groove. The half began with a 61-yard, 6:21 drive, culminating in a 1-yard score by Willie Gulley. The second possession ended with a 10-yard touchdown run by Neal Eley with 4:10 left in the quarter. The drives were impressive, but the Academics were unable to gain ground. That’s because Brookfield answered each score. There was a 10-play drive that resulted in a 1-yard score by sophomore Andrew Manesis. That made it 31-12 and a 7-yard touchdown run by Henderson pushed the lead to 38-18. And the final blow of the third quarter put an exclamation point on the night. As time expired in the quarter, McVey bolted for an 86-yard touchdown run. As the fourth quarter began, Brookfield had a 45-18 lead. For good measure, there was yet another touchdown — Jack Mix on a 2-yard jaunt midway through the fourth. Let see how they do against Barlow this coming week which should be a much better game. Where are the hillhouse fans at who care more about west haven than their own team? Henderson was a load. He wore down the interior of the House line. 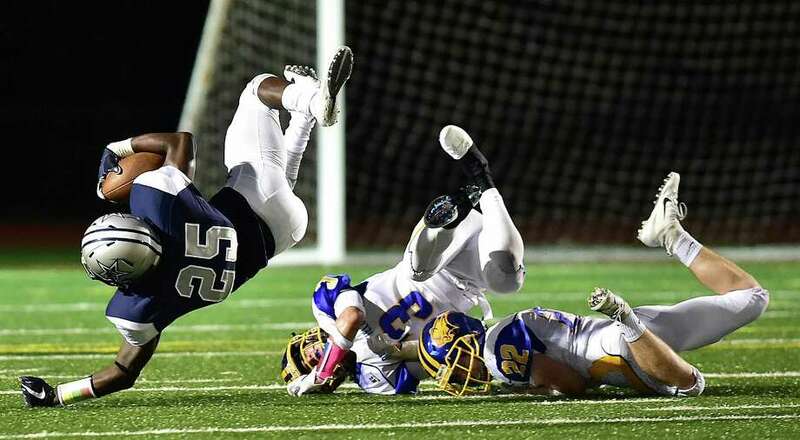 When Hillhouse started to gather some momentum in the second half, the Brookfield running game dashed any hopes of a comeback drive after drive. You can’t close the gap unless you stop the other guys. House could not stop any of them.